A cast holds a broken bone in place while it heals. Casts also help to prevent or decrease muscle contractions and can help limit movement, especially after surgery. Keep the cast clean and dry. Do not get it wet in the shower or tub or swimming pool. Ask your doctor how you can buy a protective sleeve if you think your child might be somewhere where his cast might get wet. Check for cracks and breaks in the cast. Check for rough edges. These rough edges can be padded to protect the skin from scratches. Do not scratch the skin under the cast by inserting objects inside the cast – this can cut the skin. If your child complains of itching, use a hairdryer placed on a cool setting to blow air under the cast. Never blow warm or hot air into the cast. Do not put powders or lotions inside the cast. Older children with body casts may need to use a bedpan or urinal in order to go to the bathroom. Use a diaper or sanitary napkin around the genital area to prevent leakage or splashing urine. Your child may need to have sponge baths until the cast is removed. How to wash your child's hair: Lay your child across a bed a place a bucket on the floor to catch the water as you shampoo. You can also get "no-rinse" shampoo at the drug store. 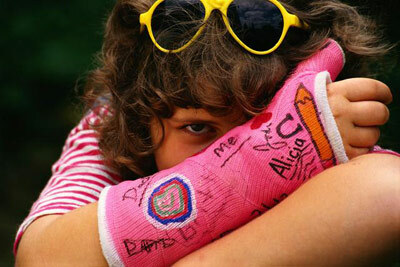 How long will my child need to wear the cast? What are the limits to my child's activity while he wears the cast? What are the limits on my child's activity once you take off the cast? You see a change in the cast; cracking, softening, drainage from the inside. You smell a bad odor coming from the cast. Your child's fingers or toes are cold, blue/gray or swollen. Your child feels numbness or tingling in the fingers or toes. Your child cannot move his/her fingers or toes. The cast is slipping off. There is increased swelling above or below the cast. The cast feels very tight.